M Stippler, M Turka, P Gerszten. Outcomes after Percutaneous TranS1 AxiaLIF® L5-S1 Interbody Fusion for Intractable Lower Back Pain. The Internet Journal of Neurosurgery. 2007 Volume 5 Number 1. Background: Interbody fusion is an accepted treatment for patients with discogenic back pain originating from the L5-S1 disc space. The AxiaLIF® system was developed as a completely percutaneous, minimally invasive method to successfully perform an L5-S1 interbody fusion. Methods: A retrospective clinical evaluation was performed on 36 consecutive patients who underwent a minimally invasive L5-S1 interbody fusion using the AxiaLIF® system. Results: At time of last follow-up, 14 patients (40%) had "resolution" of their pain and 19 patients (54%) claimed they had "significant improvement" of their low back pain. In a single patient, the symptoms worsened, and in another patient the symptoms were felt to be unchanged. A single patient required antibiotics for a superficial wound infection. Conclusion: The AxiaLIF® procedure in combination with percutaneous pedicle screw placement was found to be a feasible and safe minimally invasive technique for L5-S1 interbody fusion and is associated with good clinical outcome. The use of interbody devices has become increasingly popular because of improved rates of fusion, restoration of disc and foraminal height, and promotion of lordosis. 10 Good outcomes have been reported in 80 to 85% of patients. 11 The first successfully interbody posterior lumbar fusion was described by Cloward in 1985. 12,13 The United States Food and Drug Administration gave its final approval for the use of the interbody devices in the lumbar spine on September 20, 1996. 8 Later it was shown that similar result can be achieved with unilateral facetectomy with the graft placed with a more lateral trajectory. 14 Since that time, numerous lumbar interbody fusion techniques have bee described in the literature for the treatment of degenerative spine disease. 8 However, significant morbidity has been associated with the exposure for these fusions. 14 Over the last decade, minimally invasive approaches employing tubular retractors 1516 or standard ventral cervical retractor systems 17 using microscopy or endoscopy 18 for visualization were developed to minimize disruption of musculoligamentous support structures of the spine, which have been shown to have a major impact on outcome. 19 Besides preservation of the posterior arch and the musculoligamentous complex, minimally invasive techniques offer several other advantages, such as less nerve retraction, less blood loss, improved cosmetic results, and decreased length of hospital stay. 15 However, all these minimally invasive surgical approaches for lumbar interbody fusion employ the same surgical route and are simply smaller versions of the traditional open approaches. Hence, the patient is exposed to similar intraoperative and postoperative morbidities. The AxiaLIF ® system (TranS1, Inc., Wilmington, NC) was developed as a minimally invasive method to perform an L5-S1 interbody fusion to treat low back pain of discogenic origin at the level of the L5-S1 disc space. 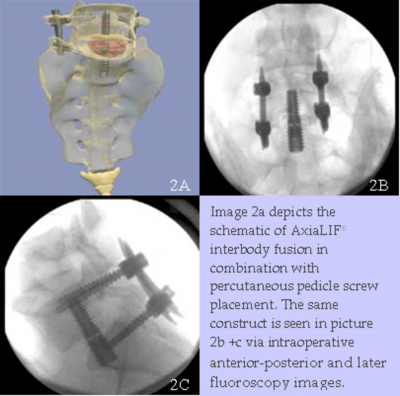 The AxiaLIF ® approach is a percutaneous alternative to the anterior, posterior, or transforaminal lumbar interbody fusion techniques. This makes it the first truly minimally invasive, percutaneously placed lumbar interbody device using the presacral fat bed. 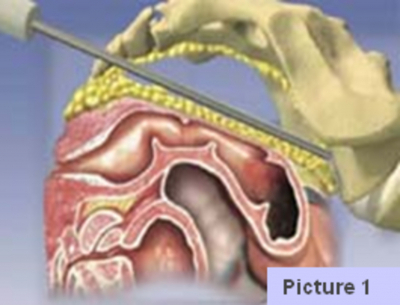 (Picture 1) The specific surgical technique has been described by Marotta et al. 20 The TranS1 AxiaLIF ® System is intended to provide anterior stabilization to the segment between the fifth lumbar vertebrae and the sacrum. The device is indicated for degenerative disc disease (DDD) with or without radicular symptoms, pseudoarthrosis from a prior unsuccessful fusion, and/or spondlylolisthesis (Grade 1 or 2). While the safety of AxiaLIF ® placement and the minimally invasive technique have been described previously 20 , there is currently a paucity of clinical outcome evaluations of this technique. Therefore, we investigated the safety and clinical improvement of LBP in a consecutive series of patients who underwent an AxiaLIF ® fusion. physician at the time of the outpatient visit. The outcome was divided into four categories (Table 1) and analyzed at 3-6 month follow-up, 6-11 month follow-up, and ≥ 12 month follow-up. Descriptive methods were employed for statistical analysis. The indications for performing the L5-S1 AxiaLIF ® interbody fusion included intractable discogenic back pain of greater than one year's duration due to degenerative disc disease, post-discectomy pain, or symptomatic Grade 1 or 2 spondylolisthesis at the L5-S1 level. All patients had LBP greater than lower extremity radicular pain. LBP was defined as “intractable” when the patient was under treatment by a pain management physician, and other non-surgical therapeutic interventions such as epidural steroid injects, facet injections, and/or active and passive physical therapy were unsuccessful in providing significant and sustained symptomatic improvement. The symptomatic L5-S1 disc space level was confirmed by magnetic resonance imaging appearance and reproduction of concordant pain on provocative discography. Between March 2006 and June 2007, 36 consecutive patients underwent the percutaneous L5-S1 AxiaLIF® interbody procedure in combination with percutaneous pedicle screw placement. The mean age of the cohort was 44 years (range 20 to 61 years). Twenty patients (56%) were male, and 16 (46%) were female. The mean duration of reported LBP for the entire patient cohort was 6 years (minimum of one year). Eighteen patients (50%) reported a component of unilateral or bilateral radicular leg pain in addition to their LBP. Two patients (6%) suffered from mechanical lower back pain secondary to Grade 1 spondylolisthesis at the L5-S1 level (Graph1). The mean follow-up for the cohort was 8 months (range 3 to 20 months). Three to six month follow-up was available in 35 patients (97%); 6 -12 month follow-up was available in 11 patients (31%) patients; ≥ 12 month follow-up was available in 7 patients (22%). Based upon the last follow-up available, 14 patients (40%) had “resolution” of their pain and 19 patients (54%) claimed they had “significant improvement” of their low back pain In a single patient the symptoms worsened, and in another patients the symptoms were felt to be unchanged (Graph 2). For patients in the 3-6 month follow-up period, LBP was felt to be completely resolved in 17 patients (49%), improved in 16 patients (46%), unchanged in 1 patient (2.5%), and worse in another (2.5%). This patient with worsening symptoms was involved in a motor vehicle accident postoperatively. The other patient who did not improve after the L5-S1 fusion subsequently underwent a second operation with extension of his fusion to incorporate the L4 level. For patients with 6 to 12 months follow-up, LBP was gone in 3 patients (27%) and improved in 8 patients (73%). For patients with greater than 12 months of follow-up, LBP was gone in 2 patients (29%) and improved in 5 patients (73%). Five patients (14%) developed a new, different quality lower back pain during the follow-up period that was treated with non-invasive modalities in all cases. No major complications occurred in this cohort. One patient developed a wound infection treated with intravenous antibiotic therapy. A single patient developed intractable pain felt to be caused by the pedicle screw instrumentation. The posterior instrumentation was removed on an elective basis after radiographs had demonstrated a solid fusion at the L5-S1 level. Chronic lower back pain is one of the most common and difficult disease processes to treat. The prevalence of lower back pain has been reported to be 20-30% in the adult population. Eight percent of all adults will have at least one episode of acute back pain during their lifetime. LBP is the largest single cause of lost work days, and the social-economic costs have been estimated to be as high as $2 billion.21 In only 5-10% of people, LBP will progress to chronic lower back pain over time. The national lower back pain study followed 2,374 patient referred for neurosurgical or orthopedic evaluation. Although 79% of the patients had a radiological abnormality on their imaging study, only 20% ultimately underwent surgical intervention.2 For chronic lower back pain without lower extremity radicular pain, the percentage of patients who are candidates for surgery may even lower. The posterior lumbar interbody fusion (PLIF) is also a well established surgical approach for the treatment of DDD and discogenic back pain. Because of its relative invasiveness, it is seen as a rescue procedure only if other non-surgical treatment options fail.25 Both the ALIF and PLIF procedures are associated with muscular and ligamentous injury, manipulation of vascular and visceral structures and neural elements, and have the potential for significant complications and subsequent life long morbidity.26 It has been shown that disruption of the lower back muscles and ligament is negatively correlated with good outcome after posterior fusion for LBP.19, 27 Although tubular retractor systems may minimize the trauma to the posterior musculoligamentous complex during surgery, the same structures are nevertheless violated.20 Newer minimally invasive approaches for posterior interbody fusions are still not truly “percutaneous” and may result in clinically significant muscle damage. The AxiaLIF® interbody system is noteworthy because it is the first truly percutaneous minimally invasive interbody fusion technique for the L5-S1 level. Because the AxiaLIF® system uses a presacral corridor, typical morbidities seen from postoperative muscle fibrosis after posterior approaches are eliminated. For this procedure, the L5-S1 intervertebral space can be accessed over the presacral fat pad while preserving the integrity of the posterior musculoligamentous support structures.28 This provides strong ligamentotaxis, interbody fusion construct stiffness, and promotes successful fusion formation according to Wolff's law.20 Additionally, the AxiaLIF® interbody system, by being an axially placed cage, provides certain theoretically superior biomechanical features over an ALIF or PLIF. Slosar et al. demonstrated that axially placed cages grant better resistance to translation, flexion, extension, and shear forces29 than traditional cages. AxiaLIF® interbody fusion can be used for patients requiring fusion to treat pseudoarthrosis from unsuccessful prior fusion, spondylolisthesis Grade 1 or 2, and degenerative disc disease causing discogenic back pain. The procedure is approved for the anterior supplemental fixation of the lumbar spine at the L5-S1 level in conjunction with a posterior fixation system. 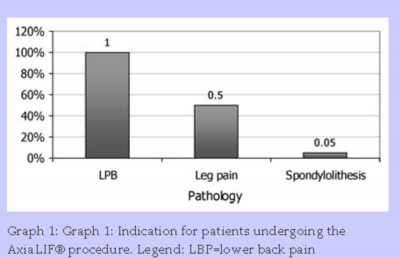 Although well established surgical techniques for the treatment of discogenic back pain exist and have acceptable results, this study attempted to demonstrate that LBP might be significantly improved using a safe and effective percutaneous minimally invasive technique. The current case series demonstrated both the safety as well as the efficacy of the AxiaLIF® procedure. Pain was improved or ameliorated in all but two patients. These clinical outcomes are comparable to those reported using both ALIF and PLIF approaches. Furthermore, the procedure was found to be safe and very well tolerated by the patients. Further follow-up of the patients who undergo this procedure will help to further define the long-term clinical outcomes of this surgical approach. These results indicate that the AxiaLIF® procedure in combination with supplemental percutaneous pedicle screw placement is a feasible and safe technique for L5-S1 interbody fusion which results in good clinical outcomes. Acknowledgments: The authors wish to thank Patricia A. Kelly and Dr. Kathy Higgins for their assistance with this work. 1. Donelson R, Aprill C, Medcalf R, Grant W. A prospective study of centralization of lumbar and referred pain. A predictor of symptomatic discs and anular competence. Spine 1997;22:1115-22. 2. Ackerman SJ, Steinberg EP, Bryan RN, BenDebba M, Long DM. Patient characteristics associated with diagnostic imaging evaluation of persistent low back problems. Spine 1997;22:1634-40; discussion 41. 3. Greenough CG, Peterson MD, Hadlow S, Fraser RD. Instrumented posterolateral lumbar fusion. Results and comparison with anterior interbody fusion. Spine 1998;23:479-86. 4. Resnick DK, Choudhri TF, Dailey AT, et al. Guidelines for the performance of fusion procedures for degenerative disease of the lumbar spine. Part 7: intractable low-back pain without stenosis or spondylolisthesis. Journal of neurosurgery 2005;2:670-2. 5. Resnick DK, Choudhri TF, Dailey AT, et al. Guidelines for the performance of fusion procedures for degenerative disease of the lumbar spine. Part 9: fusion in patients with stenosis and spondylolisthesis. Journal of neurosurgery 2005;2:679-85. 6. Resnick DK, Choudhri TF, Dailey AT, et al. Guidelines for the performance of fusion procedures for degenerative disease of the lumbar spine. Part 11: interbody techniques for lumbar fusion. Journal of neurosurgery 2005;2:692-9. 7. Linson MA, Williams H. Anterior and combined anteroposterior fusion for lumbar disc pain. A preliminary study. Spine 1991;16:143-5. 8. Kuslich SD, Ulstrom CL, Griffith SL, Ahern JW, Dowdle JD. The Bagby and Kuslich method of lumbar interbody fusion. History, techniques, and 2-year follow-up results of a United States prospective, multicenter trial. Spine 1998;23:1267-78; discussion 79. 9. Saal JA, Saal JS. Intradiscal electrothermal therapy for the treatment of chronic discogenic low back pain. Clin Sports Med 2002;21:167-87. 10. Loguidice VA, Johnson RG, Guyer RD, et al. Anterior lumbar interbody fusion. Spine 1988;13:366-9. 11. Freeman BJ, Licina P, Mehdian SH. Posterior lumbar interbody fusion combined with instrumented postero-lateral fusion: 5-year results in 60 patients. Eur Spine J 2000;9:42-6. 12. Cloward RB. Posterior lumbar interbody fusion updated. Clin Orthop Relat Res 1985:16-9. 13. Cloward RB. The treatment of ruptured lumbar intervertebral discs by vertebral body fusion. I. Indications, operative technique, after care. J Neurosurg 1953;10:154-68. 14. Humphreys SC, Hodges SD, Patwardhan AG, Eck JC, Murphy RB, Covington LA. Comparison of posterior and transforaminal approaches to lumbar interbody fusion. Spine 2001;26:567-71. 15. Khoo LT, Palmer S, Laich DT, Fessler RG. Minimally invasive percutaneous posterior lumbar interbody fusion. Neurosurgery 2002;51:S166-1. 16. Sandhu FA, Fessler RG. Minimal Invasive Transforaminal Lumbar Interbody Fusion. In: Kim DH, Fessler RG, Regan JJ, eds. Endoscopic Spinesurgery and Instrumentation. 1 ed. New York: Thieme; 2004:265-80. 17. Steinmetz MP, Resnick DK. Use of a ventral cervical retractor system for minimal access transforaminal lumbar interbody fusion: technical case report. Neurosurgery 2007;60:ONSE175-6; discussion ONSE6. 18. Isaacs RE, Podichetty VK, Santiago P, et al. Minimally invasive microendoscopy-assisted transforaminal lumbar interbody fusion with instrumentation. J Neurosurg Spine 2005;3:98-105. 19. Kawaguchi Y, Matsui H, Tsuji H. Back muscle injury after posterior lumbar spine surgery. A histologic and enzymatic analysis. Spine 1996;21:941-4. 20. Marotta N, Cosar M, Pimenta L, Khoo LT. A novel minimally invasive presacral approach and instrumentation technique for anterior L5-S1 intervertebral discectomy and fusion: technical description and case presentations. Neurosurg Focus 2006;20:E9. 21. Weinstein JN, Lurie JD, Olson PR, Bronner KK, Fisher ES. United States' trends and regional variations in lumbar spine surgery: 1992-2003. Spine 2006;31:2707-14. 22. McAfee PC. Interbody fusion cages in reconstructive operations on the spine. J Bone Joint Surg Am 1999;81:859-80. 23. Muller W. Transperiotnale Freilegung der Wirbelsaeule bei tuberkuloser spondylitis. Detsch Z Chiro 1906;85:128-37. 24. Stauffer RN, Coventry MB. Anterior interbody lumbar spine fusion. Analysis of Mayo Clinic series. J Bone Joint Surg Am 1972;54:756-68. 25. McAfee PC, Cunningham BW, Lee GA, et al. Revision strategies for salvaging or improving failed cylindrical cages. Spine 1999;24:2147-53. 26. Rajaraman V, Vingan R, Roth P, Heary RF, Conklin L, Jacobs GB. Visceral and vascular complications resulting from anterior lumbar interbody fusion. J Neurosurg 1999;91:60-4. 27. Mayer TG, Vanharanta H, Gatchel RJ, et al. Comparison of CT scan muscle measurements and isokinetic trunk strength in postoperative patients. Spine 1989;14:33-6. 28. Cragg A, Carl A, Casteneda F, Dickman C, Guterman L, Oliveira C. New percutaneous access method for minimally invasive anterior lumbosacral surgery. J Spinal Disord Tech 2004;17:21-8. 29. Slosar PJ, Reynolds JB, Koestler M. The axial cage. a pilot study for interbody fusion in higher-grade spondylolisthesis. Spine J 2001;1:115-20.